The Judaic Studies Program educates students in the history, languages, and cultures of the Jewish people from ancient times through our own. Its interdisciplinary courses, which range from biblical archeology to American Jewish literature and from moral philosophy to material culture, highlight the complexities of the Jewish experience. A wealth of internship opportunities await students interested in the arts, communal service, and politics. For more information, please consult with Jenna Weissman Joselit, director of the Program in Judaic Studies. 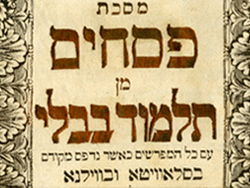 The Gelman Library has diverse and wide-ranging holdings in the field of Hebrew and Judaic studies, including modern Judaica, rare books, and archival materials. Gelman Library provides a guide to general research materials and reference resources in Judaic Studies as well as materials and resources in Holocaust Studies.